Despite the Panthers dominating the first half in terms of time of possession and in yards generated, they only managed to lead at halftime 6 to 0. The Bills would add a field goal in the fourth quarter, but the Panthers would add their own with less than three minutes left in the game. The Panthers would go on to win 9-3 after surviving a Bill two-minute drive. With that, we give you our PFF exclusive takeaways from the contest for each team. Benjamin had a solid outing against the Bills as he was QB Cam Newton’s most reliable target. The wide receiver hauled in all six of his catchable targets, including three passes that traveled more than 10 yards in the air. The rookie McCaffrey could not get anything going on the ground; however, that was mainly the offensive line’s fault as he averaged just -0.4 yards before contact, but still managed to break one tackle on eight attempts. On the other hand, McCaffrey did catch all four of his catchable targets for 34 yards as he remains a dangerous weapon out of the backfield. Davis was all over the field for the Panthers, making plays both against the run and in coverage. On the field for 16 snaps against the run, he registered two tackles resulting in defensive stop, good for a 12.5 run stop percentage. In coverage he made four tackles resulting in a defensive stop, and allowed just 10 yards on passes where he was the primary defender. 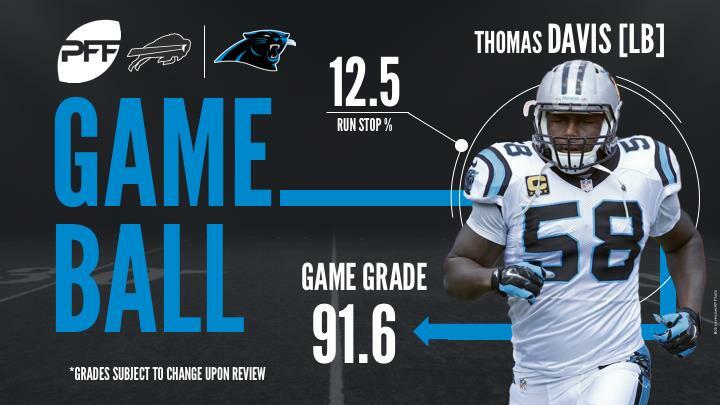 Another Panthers defender who had a huge day was last year’s second round draft pick. Targeted five times over the course of the game, he allowed just three receptions, which went for just 21 yards. More importantly, Bradberry was instrumental in the incompletions, getting physical with receivers to prevent them from making the catch. It was a rough outing for the Bills offense, but quarterback Tyrod Taylor still made plays throughout the game. As a runner he picked up 51 of his 55 yards on quarterback scrambles and forced a missed tackle. As a passer keeping him clean was key. When pressure was kept away from him he produced a passer rating of 86.1, when pressure got there, that dropped to 59.0. Hughes was the best Buffalo pass-rusher today while being among the best run defenders as well. The Bills edge rusher finished the day with five defensive stops, which led Buffalo’s defense. Furthermore, Hughes had a successful day against Carolina LT Matt Kalil as he recorded two sacks and four quarterback hurries on 28 pass rushing snaps. The second-year palyer Lawson was able to build on a solid outing against the Jets in Week 1 as he had an even better game against Carolina today. While Buffalo’s edge rusher did struggle rushing the passer since he picked up just one sack and one hurry on 26 pass rushing snaps, he was the Bills’ best run defender with a run defense grade of 90.1. Lawson constantly set the edge against the Panthers’ run plays and finished the day with five tackles, including three defensive stops.